Fuses offers wide range of transformer protection fuses in accordance to DIN & BS standard.Back up fuses are generally used for protecting transformer in the distribution network between 3.3kv/3.6kv to 33kv/36kv.These fuses are capable of breaking any fault current between the minimum breaking current(l3)and therated breaking current(l1).Selection of the fuse sall be made from the selection table and in accordance to the standards. 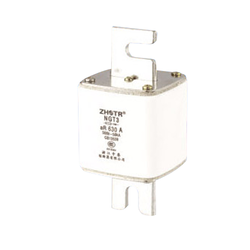 As a renowned organization, we are engaged in offering a wide range of NGT Series Fuse. Offered products are stringently tested on various quality parameters and are authenticated as per the international standards of quality. These fuses are used for the protection of transformers in the distribution network ranging from 3.3kv to 33kv rating. These are highly demanded by our clients for their high performance and easy installation.